The River Wandle just downstream of Merton Abbey Mills, with tree across river. The Wandle is a small London river which rises in Croydon and flows through Sutton, Merton and Wandsworth before joining the Thames, upstream of Wandsworth Bridge. It can be explored by kayak or canoe – but low bridges and pipes, weirs and a 500m section of subterranean paddling mean it’s not for everyone. We kayaked it on a damp Sunday in October 2013, after a few hours of heavy rainfall, thinking the rainfall would bring the flow up and help our progress. We got on at Merton Abbey Mills, using the Pay and Display car park (£5 for four hours) – and planned to paddle the river until it meets the Thames, before crossing the Thames at mid to low tide to get to our shuttle car, parked on Carnwath Road next to a river slipway (free Sunday parking). 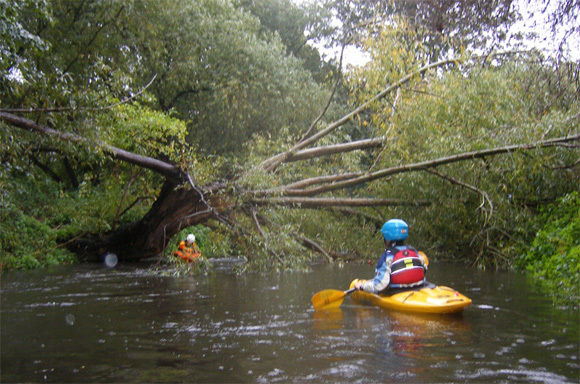 There is currently a fallen tree blocking the river about 100m downstream of Merton Abbey Mills – so most of our group got on below the tree. 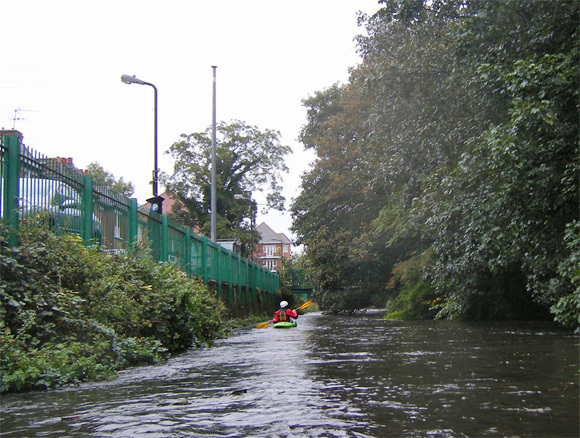 We noted that the river had risen whilst we had been changing into our kayaking kit, but decided to continue with care. There was quite a lot of tree dodging to do, but no major obstacles until we came to Connolly’s Mill, a late 18th Century water mill which spans the river. The river flows under the building, and on the day we paddled, a large river wide, standing wave had formed below the mill. This was hard to inspect, or even see in the gloom, but the sheer noise of the wave made us suitably cautious. Fortunately the noise of the wave proved bigger than it’s bite. As we hit the wave, our kayaks were accelerated towards the tunnel roof and then a low arched exit, which forced us to duck. Bear in mind that this wave is completely enclosed and at higher levels may start to recirculate. The river continued along the side of Wandle Meadow Nature Park and under a few bridges (more ducking), and after passing a number of allotments on river right we came to our final obstacle, where the river splits and drops around a high concrete island. Due to the fast flow we were unable to inspect from the river, but we were able to access the footpath on river left and check what was in store. 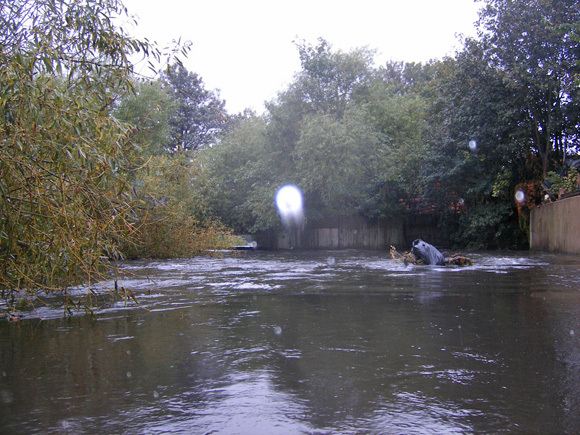 Other guides to the River Wandle refer to low pipes which can be limboed under here – but the rising water was now only inches from the pipes, which blocked both channels. Unable to paddle this section, we explored the small island, but its steep concrete walls meant any return to the river would be via vertical seal launches, into fast flowing and possibly shallow water, with no way of return. Coupled with the prospect of a further 500m section which flows under the Southside Shopping Centre (none of us fancied scraping through a flooded tunnel) we decided to call it a day. The pipes here can easily be inspected from the island and bridge, just aim for the corner of Steerforth Street and Trewint Street SW18. 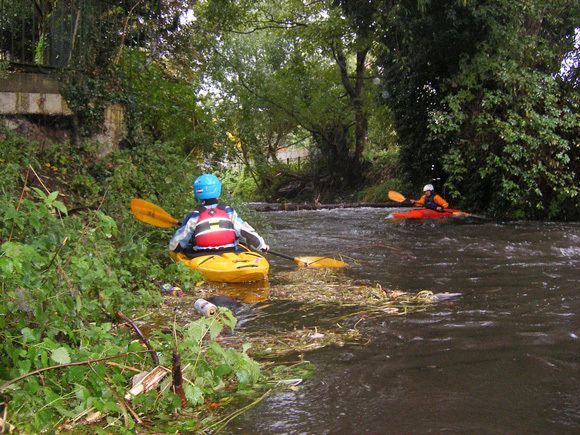 We had managed only one half of the Wandle, 2.5 miles in an hour, but we’d had a blast and we will definitely return. But next time we’ll choose lower water conditions! 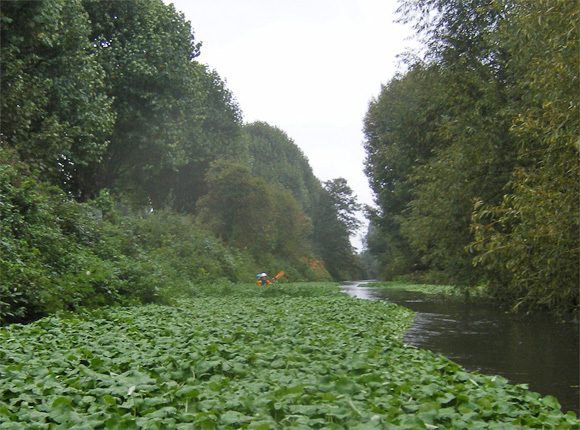 For the record – the Environment Agency online gauge for the Wandle Park Main Channel showed approx 7.2 whilst we were paddling. The river rose rapidly after rain. The unrunnable section. The river splits around an island – dropping into two channels, both crossed by low, river wide pipes. No way to kayak under the pipes, portage, or protect. Low pipes and a fast flow on the River Wandle. 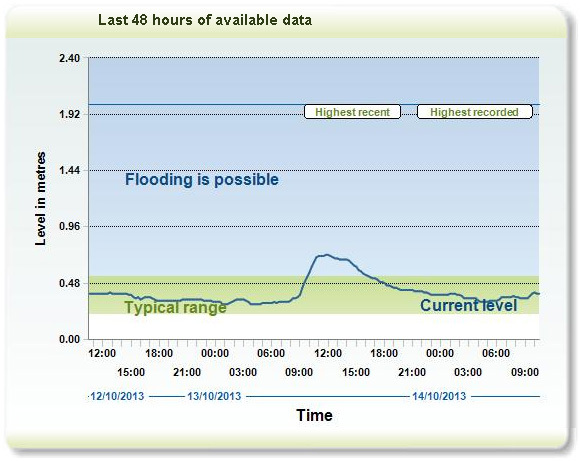 The Environment Agency online gauge for the Wandle Park Main Channel showed approx 7.2 whilst we were kayaking. 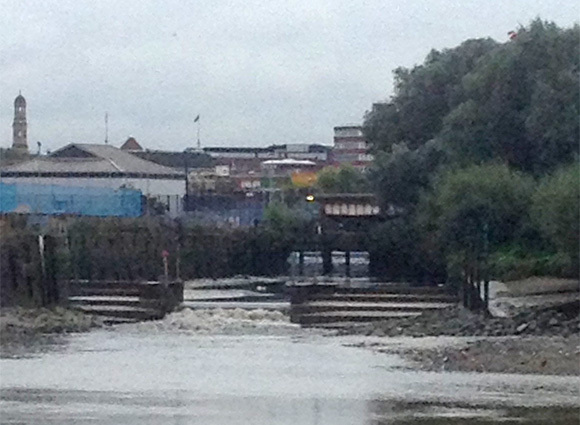 The River Wandle meets the Thames at low tide. 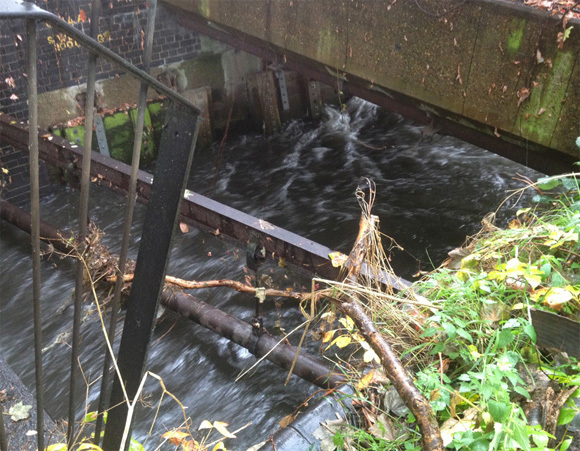 Note: Low pipes, fast flows, weirs and tidal sections can present significant problems for the urban paddler. These notes are only intended as a rough guide for experienced paddlers.